Does your umbrella school, or state, require you to test your homeschool child? Have you struggled to create your own tests? Would your homeschooling adventure be more enjoyable if you had one less thing to worry about? If questions like these intrigue you, read on! 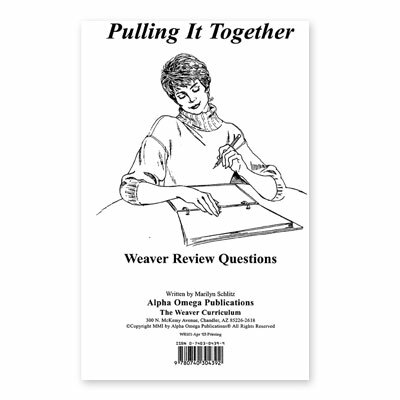 You'll be happy to know that Alpha Omega Publications has developed the Weaver Review Questions Volume 3 to assist you in testing your child. Whether you need to turn in scores to your state, or if you'd just like to know if your child is retaining information, these questions can help. Choose the questions you wish to ask and then give a grade based on your child's answers. It's that simple! Directions for figuring grades are also included within the manual. Weaver Review Questions Volume 3 uses various formats such as fill-in-the-blank, matching, essay, and more! This binder includes teacher pages with answers in bold italics, plus student pages. Give your child a copy of the student test and you'll soon know what your child knows. These questions can be used however you need to use them—you're the teacher. Order Weaver Review Questions Volume 3 from Alpha Omega Publications today and test your child's intellect!